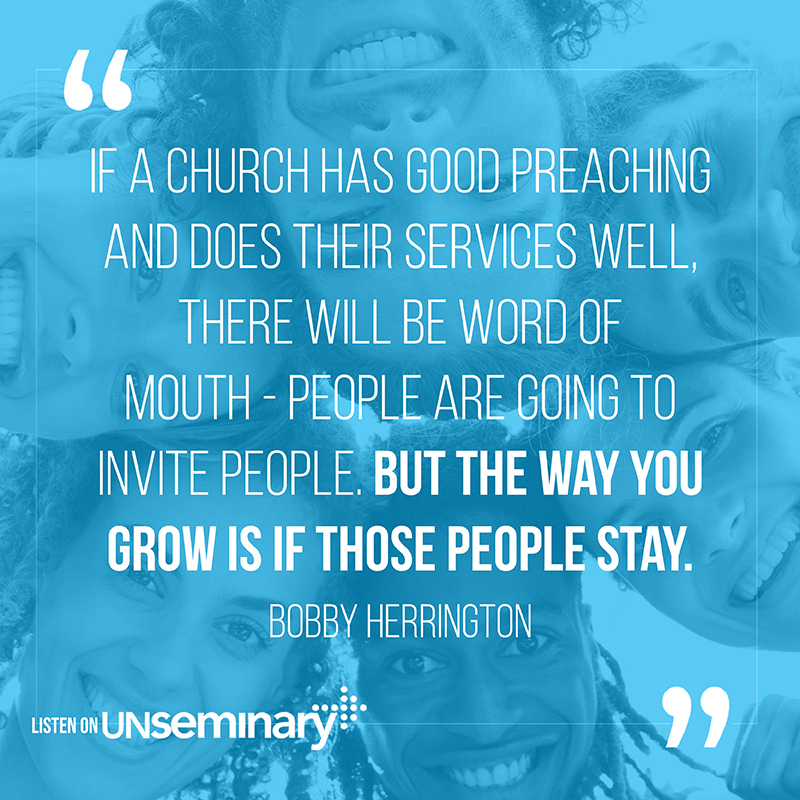 Welcome to this week’s unSeminary podcast and thank you for joining us. I’m honored to talk today with Bobby Herrington, the executive pastor at Mercy Hill Church in Greensboro, North Carolina. Mercy Hill started in 2012 as a plant of the Summit Church, and is now one of the fastest growing churches in the country. Mercy Hill has an attractional-feel with a simple church model; their primary goal to be gospel-centered in everything they do. As Bobby says, they don’t want anything to be offensive to people except the gospel. They have had exponential growth since their plant four years ago and have seen the church attendance double each year. Bobby is with us today to talk about how they grew their church and how you can incorporate these ideas into your own church. Plug into the body of Christ. // During Mercy Hill’s beginning, the church held services on Sunday nights in a clubhouse at a local park. It wasn’t the ideal setting, but it worked to get the church started. Bobby admits they didn’t think enough about assimilation when the church was planted. Their membership class focused primarily on the theological beliefs of the church, but other than signing a covenant members were not asked to take next steps or contribute in any way.. It was a simple set up and this worked for the first year and a half, but then Mercy Hill realized that this method was not actually helping people get plugged into church life. They were getting people to hear the gospel, but they weren’t really doing anything else. Change the ways to plug into the church. // As Mercy Hill grew, they realized they needed to change their assimilation structure. At the same time they decided to rework the assimilation process, they also happened to be shifting their services from Sunday nights to Sunday mornings. Revamping everything created even more opportunities for growth and Mercy Hill and went from 300 to 900 people within a 3 to 4 month period. So what did they change? During this time, they shut down all of the “doors” for getting involved in the church except for their new Weekender process. This new experience became the single way to get connected and plugged in at Mercy Hill. Currently it’s held once a month over the course of a weekend, but Mercy Hill reminds their community about it almost every single Sunday of the year. Now when people bring friends who are interested in becoming connected to the church, everyone knows that the only way to get involved is through the Weekender. Plug people into doing something. // The Weekender was created to help people take their next steps at Mercy Hill – from the beginning the church wanted it to focus on more than just affirming beliefs and signing a covenant. The Weekender takes place once a month over a Friday night, Saturday morning, and Sunday morning. There were those who doubted that the process would work since it would require a high commitment: people would need to give up 6 hours of their weekend to attend. But during the first year alone over 400 people attended the Weekender and got plugged in! The Weekender continues to be a a successful way to assimilate new people into the church. You can learn more about Mercy Hill Church at their website mercyhillgso.com. 01:08 // Rich introduces Bobby Herrington and welcomes him to the show. 01:51 // Bobby Herrington tells us about Mercy Church. 03:15 // Bobby talks about how and why the church transitioned. 06:39 // Bobby talks about connecting with people. 08:36 // Bobby introduces us to the Weekender. 12:42 // Bobby highlights some of the impacts of the Weekender. 15:11 // Bobby reminds us the importance of the assimilation process. Rich – Well hey everybody, welcome to the unSeminary podcast, my name’s Rich, the host around these parts. You know every week here at unSeminary we try to gather great leaders from across the country who are leading in some fantastic churches to give you an insight into what’s happening in their church and also provide you some kind of practical help, and today’s going to be no exception. It’s certainly my owner today to have Bobby Herrington, he is the executive pastor Mercy Hill Church, this is a fantastic church in Greensboro, North Carolina, which is a relatively new church and birthed out of The Summit Church. You may know J.D. Greear and their vision really to plant a thousand churches over the next four years. Mercy Hill started out in 2012, it’s one of the fastest-growing churches in the country and Bobby has the distinct honor of being the executive pastor trying to wrangle all that and make it happen. So Bobby, welcome to the show. Bobby – Yeah man thanks for having me, I really excited about it. Rich – I’m so honored the you’d be here. Why don’t we start with, tell us a little bit about Mercy Hill, if people were to come this weekend, what would they experience and tell us about your role there? Bobby – Yeah, so Mercy Hill, we’re four years old as a church, we’ve just seen kind of exponential growth over the last four years, just through being planted by The Summit Church and just kind of having almost a doubling every single year of the last four years. Bobby – Way more than we can expect and man, what an awesome problem to have, good stress, bad stress. Rich – That’s a gold-plated problem. Bobby – We try to really be a gospel center church in our preaching, expositional preaching, also very attractional in terms of the feel, you know, we don’t want anything to be offensive to people, accept the gospel. So we want people to feel very welcome, just when they come and the feel of it and worship and everything. So man, the main thing we do as a church is our weekend gatherings and then our community groups. I mean we do other things but that’s king of primarily what we do. We’re a very simple church model. Bobby – Yeah, that’s kind of us in a nutshell. Rich – Well that’s amazing, that doubling every year. I know there’s probably a lot of church leaders that are listening in that are like, “Wow I’d love to have that problem,” but it really is a problem, that’s a lot of people to try to get plugged in, get connected to the church. How are you doing that, what does that look like at Mercy Hill, how are you kind of getting people, you know, I sometimes I like using the word assimilation, but that does remind me of the board from Star Trek, so how do you get people assimilated and get plugged into Mercy Hill. Bobby – Yeah, we’ve had a bit of a transition with that over the last four years. We’re kind of unique in that the first, almost year-and-a-half we met at night in a park. Bobby – In a clubhouse at our park. Rich – Like, Sunday night? Bobby – Really honestly not ideal, probably the worst church building setting you could imagine. A 1970s clubhouse in a park, wood paneling all over the walls. So that was kind of what we were doing and we were doing our best to assimilate people, but I think we were doing what a lot of churches do and at least kind of in our sphere or type of church, we were doing a class, it wasn’t once a month, it was maybe once a quarter, every two months, it was kind of random when it was, we’d announce it, people would come. We wouldn’t put a ton of effort into it, I mean we didn’t have a ton of stone involvement; I would be there one other staff person would maybe be there and we would really just kind of talk about the theological beliefs of the church, what we believe, and basically just try to get people to commit to that. We would have a church covenant they would sign and that was kind of it. It kind of worked for us I guess for the first year-and-a-half but we finally just kind of realized, it’s really not assimilating people into actually what we want them to do, as a person who’s actually like plugged in to the body. Rich – Before I move on, what was happening when you started to have this creeping sense of like, “This just isn’t working,” what was it that was kind of some of the evidence that you were thinking, “We need to shift this,” before you made a change? Bobby – Yeah, well one, our lead pastor, Andrew Hopper, he had a conversation with another pastor in town, an awesome church, Ark Church, and he was just kind of encouraging us, “Man, you guys maybe just need to think more about your assimilation process,” you know, they did a growth track. So Andrew kind of came out of that and we just kind of spent some time, really just kind of brainstorming, “Hey, how can we change what we do?” and we just really realized, we’re trying to get people to affirm the beliefs of the church but we’re not really having them do anything coming out of our assimilation process. So they’re not necessarily like plugging in to serve or to give or to get into a community group, or to do community ministry, it’s like they’re just kind of coming out and kind of checking a box and saying, “Hey we’re going to be part of your church.” But I kind of feel like the New Testament church membership is really more about, it is about the beliefs obviously, but it’s really about a certain group of people together, one local body, doing certain things together. So it’s a community sharing the gospel, giving, generosity, stewardship, all of those things. That’s the part we just totally were missing. Rich – Interesting, yeah I know, in our church when we launch a new campus, we have a similar kind of focus in that the only thing that people can sign up for is to volunteer, to plug in and actually make the thing happen. We don’t really want to know, are you just going to go to the new thing, we want to know, are you going to plug in, are you going to be a part of it, are you going to make it happen? So what did you shift to? So you kind of went from like more of a standard, it sounds like more like a theological, kind of, “This is what we believe,” to “Here’s how we want you to engage, here’s how we want you to plug in,” what did that look like, how did you kind of increase the engagement? Bobby – Yeah, so we did about three or four things just completely different, we really just kind of blew up the old process and it was really a God thing for us in terms of the timing because it happened right when we switched from Sunday nights to Sunday mornings. We went from like 400 to like 900 people in like a three or four month period. We were also switching out assimilation process during the same time, so it just happened, it was really the perfect time for us. The first thing we did is, we closed all the other doors of connection to our church. Sometimes in churches it’s like, man you can sign up to volunteer, you can sign up for a community group, you can maybe sign up for something for community ministry, so there’s a lot of different doors that a person can connect to the church. So we just totally shut all of those doors down. 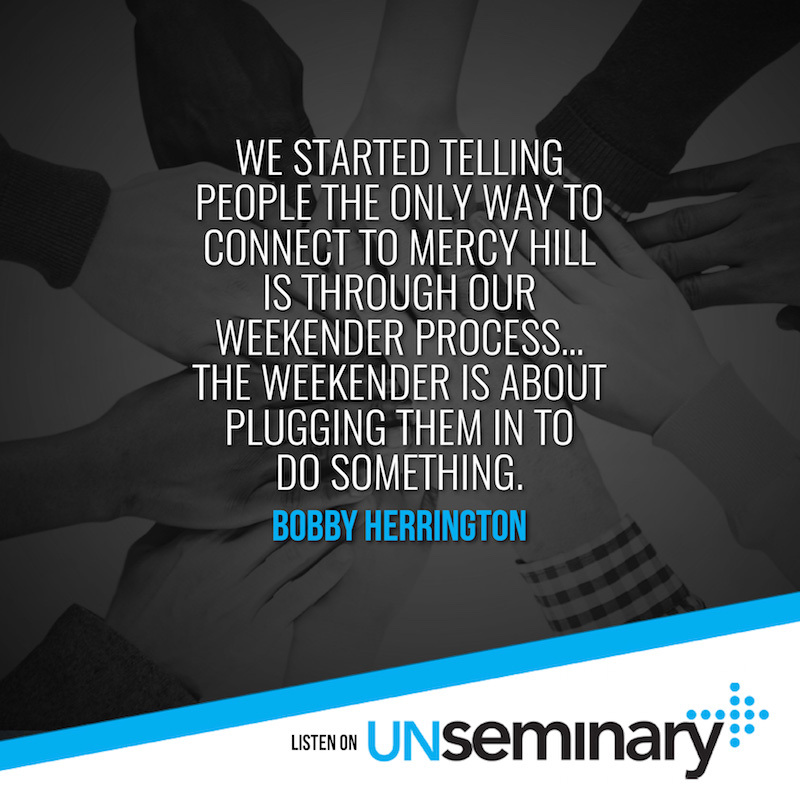 Bobby – We started telling people, “Hey, pretty much the only way to connect to Mercy Hill is through our Weekender process,” so we shut all the other doors down. The other thing we did, and I don’t know why we just hadn’t thought of this before, we started announcing it, pretty much every single week. Rich – Oh okay, yeah. Bobby – So we have it once a month and we announce it probably 45 of the 52 weeks a year. Rich – Wow. So you’re constantly talking about it, you’re constantly moving people towards it. Bobby – Yeah, so in our services we only do two announcements, we’ll do two announcements and some sort of missional blessing, pray for missionaries, the congregation, whatever. So typically, every single week one of those announcements is the Weekender. Bobby – That’s the big board to connect to Mercy Hill. Rich – Interesting. Now how much of the retool would you say was this, the fact that you’re doing it all the time, has that been critical to the success do you feel like? Bobby – Yeah, we do it once a month. Rich – Once a month. Bobby – Besides the month of December and then we’ll take one month off in the summer, so it’s very consistent. We have very high stuff commitments, so on the Friday night of the Weekender, pretty much our entire staff is there. Bobby – Definitely all our full-time staff. So we’ve got 29 people on staff from intern, full-time and I would say 15 of them are going to be there on that Friday night of the Weedender. So people kind of feel that. Rich – Right, right, right. Bobby – The other thing that we did in terms of just changing the whole process is changing it into something that’s more than just what people believe, but the Weekender is about plugging them in to do some things. So the basic kind of format, it’s a Friday night, Saturday morning and then Sunday they shadow one of our teams. Rich – Well let’s back up here. Bobby – No, it is a Weekender. Rich – I thought that was just a clever name. Rich – So you went from like a one-hour class or something like that, every couple of months, to a Friday night, Saturday morning and Sunday experience? Rich – Oh my goodness. Okay, so walk through what happens on each of those. Rich – It sounds crazy right? It’s crazy. Bobby – Yeah, you’re asking people to give up like six hours of their weekend or whatever, but we tried it, we saw like 400 people the very first year and were only a church of like 800 at the time, or 900. Rich – Oh my goodness, wow. Bobby – So Friday night is really kind of the theological portion, where we had two kind of hour long talks. So they come Friday night, we have a nice catered meal. Let’s say they’ll be 10, 15 tables. One of the hosts at every table is a staff member, so all of our staff members and their spouses will be there hosting the tables. So the people come, hang out for 30 to 45 minutes, just get to know our staff, hang out, meet people, meet some other new people that are at their table and just plug into the church and then we’ll have two talks that are more theological. The first one is on our ministry plumb lines. They use this a lot at the summit, J’s real big on these and we kind of use these and it’s all about our kind of DNA and ministry philosophy. So we just kind of talk about how we do ministry as a church. So we want people to be very clear that we’re a simple church, we don’t own a ton of ministries, we just do a couple of different ones, so people really understand our ministry philosophy. Then the second talk we do is more theological where I do a teaching on, really some of the big core theological beliefs of the church, you know, the bible, baptism, the church, elders, kind of all of that. So that’s Friday night. Saturday morning is all about how people get connected to the church. So we have a talk on generosity, we have a talk on serving, so that Sunday morning, first impressions, our tech team, all of that. Then we have a talk on community groups. Sunday they come, we have three services right now, so we have two Sunday morning services and a Sunday night service, they’re all the exact same service. They come and they shadow a volunteer team on Sunday and get plugged in that way. Bobby – So that’s kind of the whole process. Rich – Now talk about the results from that. So compare and contrast, you talked a little bit about that, the first year you did it you assimilated 400 people, how does that compare to like first time guests, what are you kind of seeing as the results of all of that activity, because that’s a tremendous amount of activity? Bobby – Right, right, yeah, we’re seeing a lot of people plug into to serve coming out of it and plug into the things that we’re kind of asking them to plug into. We’re very clear up front that it’s the whole weekend, it’s kind of a big commitment, but it’s very, very important for us and we kind of feel like we’ve been able to call people up to that level and a lot of times people just kind of dive in head first. Bobby – So yeah, every month it’s a little different. Some months we’ll see people that haven’t been at the church for like two years or 18 months. Rich – Where have you been? Bobby – Yeah, they kind of feel a little embarrassed when they tell you they haven’t been to church for two years. Then during other seasons, especially seasons where there’s a lot of first time guests, we’ll just see a ton of first time guests at the Weekender. Some people are not ready, especially in an environment where we have a lot of college students, maybe a lot of unbelievers coming to the church, some people just aren’t ready for that. Bobby – Kind of jumping in feet first, but other people, maybe they moved to the area and they’re a believer and they’ve got some church background, it’s just kind of an easy process for them to just kind of plug right in. Rich – Wow, that’s amazing. So how many people attend on a weekend now and what’s the last few months’ kind of average Weekender attendance? I’m trying to get a sense of scale of what the means. Bobby – Right, so our church size right now, we have probably 350 college students maybe, so they just all left for the semester. Rich – Right, so you [Inaudible 00:14:07]. Bobby – There’s a lot of them going back up North and stuff, we have some private schools, we see a lot of that. So right now we’re probably, total attendance, 14 or 15 hundred people. Bobby – I’d imagine in the fall we’re going to be up near 2 thousand probably, 19 hundred, something like that. Bobby – So that kind of gives you an idea of our size. Bobby – Our Weekenders are typically anywhere between 25 on the small size, to 90 maybe, just depending on kind of how things are going. So a lot of times we’ll have a smaller, like 30 to 35 and then we’ll have one with like 65 or 70. Rich – Right, but even at 90, that’s still a reasonable size group to connect with, that’s not an overwhelming number of people, particularly on a Friday night, if you’ve got 15 staff there, everybody’s going to get a touch, everybody going to get connected with somebody, that’s amazing. Now what would you say to other churches that are thinking, “Maybe this is an interesting way to go, maybe we should go crazy like these guys and jump in,” what would you do different, knowing now what you do about the Weekender? 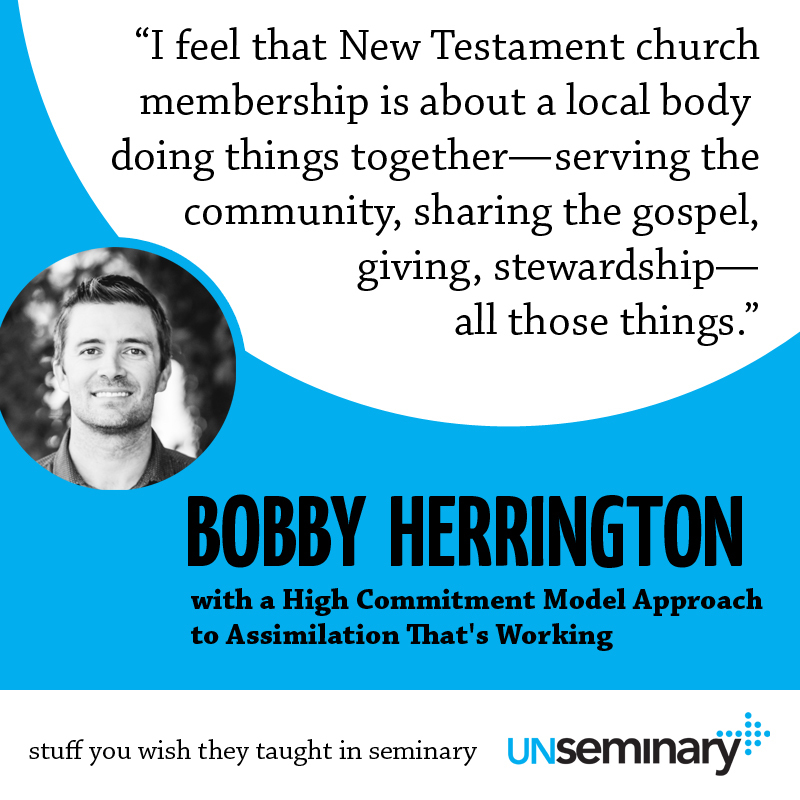 Bobby – Yeah, man I just think we didn’t think enough about assimilation on the front end when we started our church. Bobby – I mean, we’re in the South, so sometimes people in the South just show up for church and they don’t even know why, somebody just invited them. It’s a more kind of friendly environment. But in general I would say, man, if a church has good preaching and they do their services well, there’s going to be word of mouth advertising, people are going to invite people. But the way you grow is if those people stay. Bobby – It’s like Larry Osborne’s book, Sticky Church, it’s like man, you can have as many people come to the front door as you want but there really is a difference between churches that are growing and churches that are not, it’s not that new people don’t ever show up, it’s just that new people that show up actually stay. Bobby – So however you do the assimilation process at your church, it’s got to be maybe the very most important thing that you do besides preaching the gospel. Bobby – That’s like what attracts people and then that’s what gets people to stay. Rich – Absolutely, you know I think most churches, actually their problem, it’s not really are there enough guests coming to the church, even small churches, that’s really not their problem, their problem is getting people to stick and stay and what I love that you’re doing here is you’ve put a bunch of resources, effort and energy towards trying to capture those people and I think there is something behind, you mentioned it there, there is something about kind of a high call, like hey, this is a big deal, you’re going to have to invest a bunch in this to make this happen, which then sets people up in the right mindset for then, when you’re articulating, “Hey, here is your next step. Here’s how you take those next steps,” because they’ve already made a huge commitment to be there in the first place.